Do you think that this dish is an Italian dish? The name tetrazzini sounds Italian but actually it is an American dish. It consists of pasta, poultry or seafood, butter, cream, milk, sherry, cream of mushroom soup and Parmesan cheese. 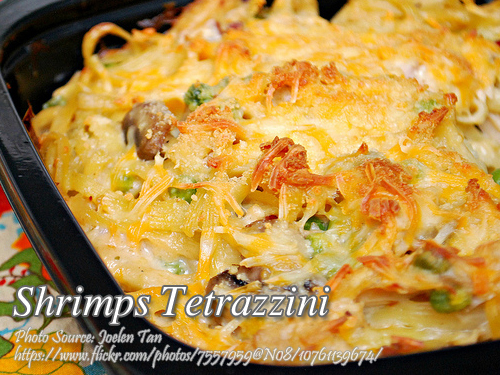 This version of shrimp tetrazzini is already adapted to the Pinoy taste. In case you are wondering where to get the shrimp juice, it is made by pounding the shrimp heads in a mortar and pestle or you can put it in a blender with 3/4 cup of water. Then strain in a cheese cloth or fine sieve to get the juice. To cook shrimp tetrazzini; Pre-heat oven to 375 °F. Cook spaghetti according to package directions or your can follow this spaghetti recipe pasta cooking direction. Drain and set aside. Heat a saucepan and put butter. When butter is heated saute garlic, onions, mushrooms and shrimps for a few minutes. In a bowl combine and mix cream of mushroom soup, milk, shrimp juice and sherry. Pour over the sauteed mixture. Allow to boil for 10 minutes and stir occasionally to avoid burning. Arrange layers of spaghetti in a casserole and top each layer with the shrimp mixture. Sprinkle with grates Parmesan cheese and chopped parsley. Bake at least 25 minutes until cooked. If desired, you can place it under a broiler to brown the cheese. pasta cooking direction. Drain and set aside. Heat a saucepan and put butter. When butter is heated saute garlic, onions, mushrooms and shrimps for a few minutes. In a bowl combine and mix cream of mushroom soup, milk, shrimp juice and sherry. Pour over the sauteed mixture. Allow to boil for 10 minutes and stir occasionally to avoid burning. Arrange layers of spaghetti in a casserole and top each layer with the shrimp mixture. Sprinkle with grates Parmesan cheese and chopped parsley. Bake at least 25 minutes until cooked. If desired, you can place it under a broiler to brown the cheese.